Many British citizens living in Hong Kong will be eligible to vote in the referendum on the UK’s membership of the European Union, due to take place by the end of 2017.
your passport to hand, if you have one. 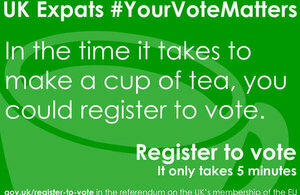 The whole registration process can be done online in just a few minutes at www.gov.uk/register-to-vote. If you cannot or do not want to register online, you can still download and post back paper forms. But remember to return your completed form as far in advance of the deadline as possible. Once you have registered, you can choose how you wish to vote. You can vote by post, by proxy (voting by appointing someone you trust to vote on your behalf), or even in person at your polling station. Some people who registered to vote in the 2015 General Election received their postal votes too late. This time, postal votes will be sent out earlier. Overseas Voter Registration Day is also the perfect opportunity for you to encourage friends, family or colleagues to check if they can take part and ask them to go online to register from wherever they are in the world. If you were too young when you left the UK to have been registered, then you can register as an overseas voter if your parents (or guardians) were registered in the UK in the last 15 years. If you don’t have or know your National Insurance number you can still register, but you may have to supply more information to show who you are.